found that there were two kinds of home cook. One was interested in savoury foods, the other in sweets; our customers were “the cooks” and “the bakers”. Since then, I’ve taken note of the preferences of my friends and acquaintances and found that there are very few people who are in the middle of that spectrum. A notable example is my friend Cathy, who loves to serve a meal of at least three courses, complete with a luscious cake for dessert. Though I, myself, am near the savoury end of the spectrum, I highly recommend one of her favourite cookbooks, The Cake Bible, by Rose Levy Berenbaum. 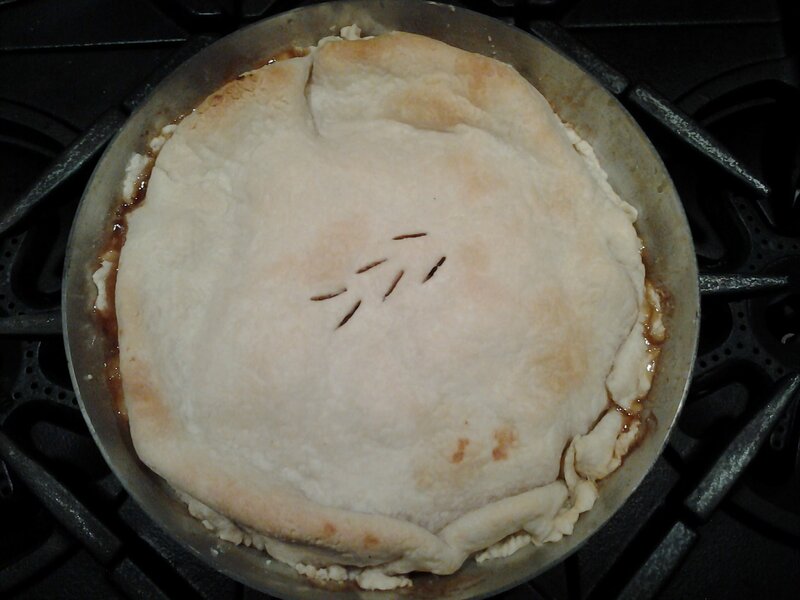 In spite of my lack of enthusiasm for baking in general, I do love to eat pie. There’s something very satisfying about biting into sweet, juicy fruit or spicy custard enveloped in flaky, buttery pastry. What’s not to love about that? 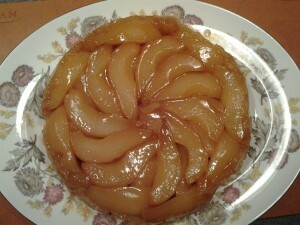 So a few weeks ago, when beautiful pears were plentiful, I made a very good pear Tarte Tatin. Reducing the syrup a bit more would have made it excellent, if I do say so myself. Pear Tarte Tatin is really a variation on an old French favourite. Apples are cooked on the stovetop, covered with pastry, baked and then turned out so the crust cradles the fruit and sweet syrupy juices. Once I got the idea to make a pear Tarte Tatin, I looked it up in Rose Levy Bernbaum’s other book, The Pie and Pastry Bible. Lo and behold, she offers a recipe for pear Tarte Tatin. Her methods can be complicated and time consuming; after all, she makes her living making food the best it can be. So, though I didn’t use her method, she gave me a few tips on making the perfect pear Tarte Tatin. Preheat the oven to 425°F or the correct temperature for your pastry recipe. Peel, core and slice the pears lengthwise into eighths. In a large bowl, toss them with the lemon juice. Heat the butter and sugar in a Tatin pan or ovenproof 9in/22.5cm pan with sides about 2in/5cm high. 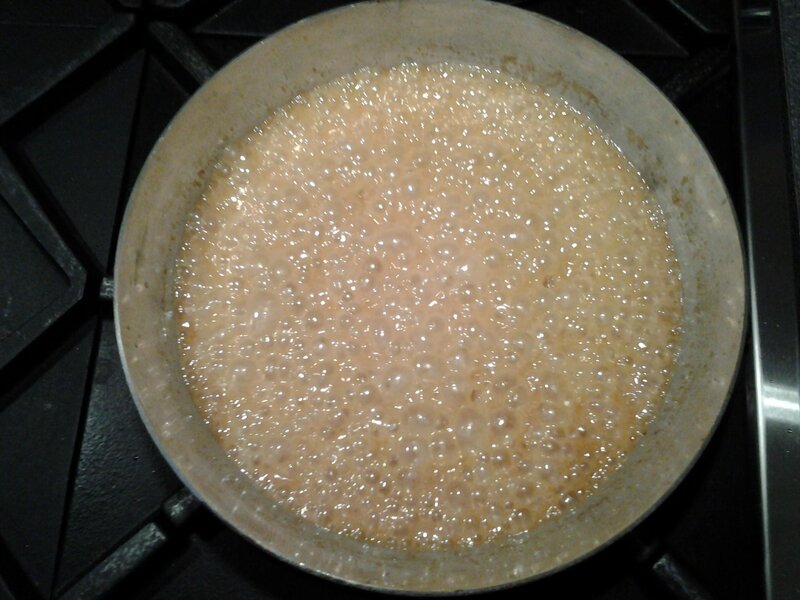 Cook at medium heat, stirring often until the sugar caramelizes, thickens and turns a deep amber or reddish colour, about 5 minutes. 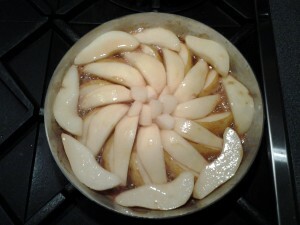 Remove the pan from the heat and arrange the pear slices in overlapping circles on the caramel. Return to the heat and cook, keeping the heat as high as possible without the sauce spattering out of the pan. Baste the fruit often with the juice – a bulb baster is the easiest thing to use for this. Press the fruit down gently as it cooks so there are no large gaps between the pieces. When the juices are evaporated to a thick sauce, at least 10 minutes, remove the pan from the heat. Roll the pastry into a circle about 1 ¼ in/3cm larger than the tart pan. Fold it in quarters or drape over the rolling pin and place it on the fruit. Working quickly so the pastry doesn’t melt, tuck the edges down inside the pan with a table knife blade or small spatula. Cut a few vents in the centre of the pastry and place the completed pear Tart Tatin in the centre of the oven. Bake for about 30 minutes, until the pastry is golden, remove from the oven and let stand a few minutes to set. Run a knife or metal spatula around the edge of the tart to ensure it is loosened from the pan. Choose a serving plate with a lip to catch any remaining juices and flip it upside-down on top of the tart pan. With one smooth movement, turn the pan and serving plate over. Allow the whole thing to stand about 5 minutes and then lift the pan off the inverted tart. Any fruit that has stuck to the pan can be replaced on the tart. Slice and top with whipped cream or crème fraiche. Caution! Be careful not to touch the pan or caramel – they are extremely hot. Have you made a significant variation of one of your favourite recipes? Have you had an extraordinary pie? What was it and who made it? Hendry Warren LLP: Accounting and Taxation Specialists.